Posted July 9, 2014 by Dr. Kezirian & filed under Sleep Apnea. One of the most interesting parts of my work is being involved in the development and evaluation of treatments for snoring and obstructive sleep apnea. I have had the opportunity to work with many established and startup companies in their hard work creating and testing new approaches,and I pride myself on being a harsh critic, playing devil’s advocate as I look to identify the potential problems with these ideas and scrutinize data from clinical trials. Of course, there are many companies with whom I have not worked, and I try to follow their work as closely as possible from a distance. 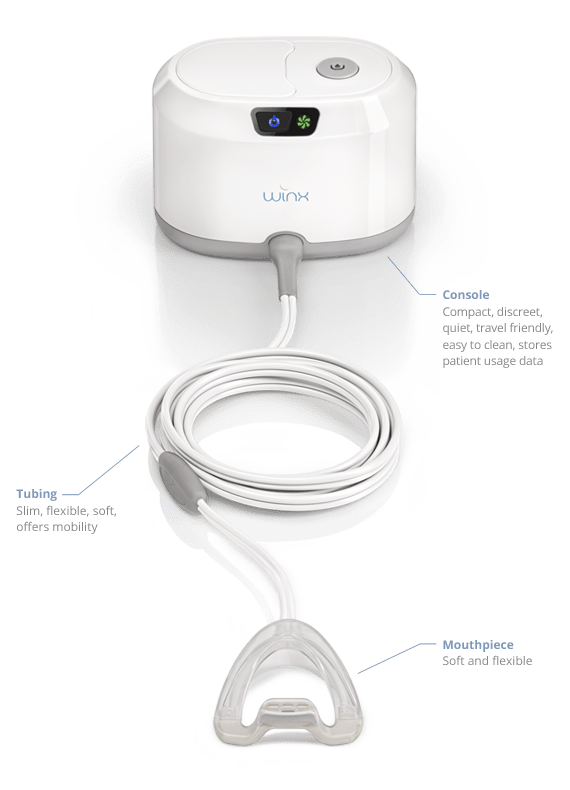 One such company is Apnicure, who has developed a device (sold as Winx) that treats obstructive sleep apnea using suction through a mouthpiece to pull forward structures inside the mouth and throat. The mouthpiece is placed loosely over the upper teeth and has a suction port in the back, next to the soft palate. The mouthpiece does not hold the lower jaw forward like oral appliances–and therefore avoids the potential side effects of TMJ problems, tooth movement, and tooth pain that oral appliances can cause. Instead, a suction pump that rests next to an individual’s bed is connected to the device with a thin tubing (see image below from the company’s website). The idea is creative and clever, as it is almost the opposite of positive airway pressure therapy. If it worked well, this could be a powerful and important addition to sleep apnea treatment. Does Winx work to treat sleep apnea? Unfortunately, studies show that it does not work very well for many patients. A 2013 study from Dr. Ian Colrain from SRI Biosciences and colleagues published in the medical journal Sleep Medicine showed that only about 1 in 3 patients (32%, or 20/63) had a substantial improvement in their sleep apnea. The median (somewhat similar to an average) number of times per hour with blockage in breathing (apnea-hypopnea index) improved from 27.5 to about 14; there was an improvement in sleepiness and quality of life, although the quality of life changes were somewhat small. The Winx has some advantages, in that it does not require surgery and has low risks (although some patients cannot tolerate it due to discomfort), but these results are not good enough to recommend it for widespread use. These results were disappointing and confusing, as it was expected that applying suction to the tongue and soft palate would be more beneficial. This month, an article published in the medical journal Sleep provides an explanation for the less than ideal results. In a series of 15 participants, Dr. Richard Schwab from the University of Pennsylvania and colleagues performed MRI studies of the head and neck before and after placement of the Winx device to learn more about how the device was working. They showed that the device opened the area behind the soft palate (what I call the Palate Region on my website) but actually narrowed the space for breathing behind the tongue (Tongue Region). With this study, the suboptimal outcomes reported in previous Winx studies makes sense. Everything we know about treating different areas of the nose and throat in snoring and sleep apnea, including my own research on drug-induced sleep endoscopy, suggests that opening the Palate Region but closing the Tongue Region does not work well for most patients with sleep apnea. Apnicure’s next step is to improve the device design, and it is reassuring that Apnicure recently added to their solid team of experts by hiring Dr. David White as Chief Scientific Officer. David is one of the world’s leaders in the factors that cause sleep apnea and has been a gracious, supportive, and invaluable mentor to me (and so many others) over the past decade. I look forward to Apnicure’s efforts to do everything possible as they attempt to improve their approach and achieve better results. Can I volunteer for any upcoming experimental trials? I do not think they are currently performing any trials. You can certainly contact the company to ask about this. Dr. Kezirian: Any updates on their progress since this publication? Will be looking for details from others you identified here to find more recent reports. I do not believe that they have any new scientific evaluations, but you can certainly contact the company directly to confirm this. Doctor, I live in Illinois and Apnicure told me directly they do not trial this device in my area. From their website, it appears local to California only? I am desperate to trial anything as I have been on APAP, BiPAP, and ASV over 18 months without much success. Getting some minor improvement on a Respironics 960P ASV unit, but that’s it. My average AHI is under 3/hour and I still have <88% desats over 5 minutes per night. Very high EPAP/IPAP on the ASV. Wear a Resmed Narval MAD, cervical collar, elevated bed, NightShift positional therapy device and a backpack with an air bladder in it to avoid supine position. Take 10 mg Zolpidem per night, exercise 3-4 days per week. BMI<29 but difficulty losing additional weight. Tried a tongue advancement bulb but too painful to adjust to it. Narval MAD causes frequent TMJ / Tinnitus so cannot utilize aggressive rod settings. Rush Hospital / other clinics in Chicago have evaluated and determined I'm not a good candidate for surgery or hypoglossal stimulator (not even mandibular advancement) as my throat cross-sectional area is too small, as well as my AHI being too low. Since my AHI is < 5 insurance covers only doctor visits where the result is always head-scratching. I wake up fatigued, headachey and nauseous every day. ABG, Comprehensive / Metabolic panels and MRI all came back fine. Please, where can I get on a list to trial anything new and/or different, anything at all. Thank you for the post. It sounds like you have explored quite a few options. You may not be a candidate for the hypoglossal nerve stimulator, but there are other surgical options out there. You could see Michael Friedman or Phil LoSavio in Chicago. I would also be happy to see you if you wanted to travel to Los Angeles. If this treatment can work and can help patients with sleep apnea, why doesn’t Medicare or insurance pay for it? It does not work all that well, first of all. Medicare and insurance coverage are complex issues, so it is more than just trial results. I purchased my winks unit at $1000+ out of pocket approximately 3 years ago. I liked the idea that it was a small denture shaped piece that went in my mouth. ( no, suffocating facial mask necessary. ) I still felt tired throughout the day and didn’t personally feel that helped with any thing. Mouthpieces need to be replaced every three months at an expensive $150. The tubing and The saliva catcher container that sets inside the machine also need frequent changes with out-of-pocket cost. Even though the equipment was cleaned daily and replaced frequently…there was still a musty smell. I contacted the company and they sent A new container that did not solve the issue. Then, the company claimed that the WINX machine was being re-designed. However I have not heard any updates and I am now back on CPAP with a dream mask THAT INSURANCE helps pay. I feel that I spent & wasted a lot of money on the WINX machine. I have been using winx for 8 months or so. I am not sure of its working or not. I have been told there is an SD card ..and to do something w. That..need to follow up on what that is exactly. I am single. .sleep alone..so I had no idea I had sever sleep apnea till I randomly did a sleep study. I’m also trying to reach then to get a new moithpiece, etc..but a nice website comes to a 404 error. Emailed company today to see about both questions. My question here..what’s the next better option? I think the company (Apnicure) may be closing operations, but I am not entirely sure. Looks like the company has gone out of business – without Winx is there another sleep devise to recommend that does not involve CPAP mask? There are no devices to recommend other than those involved in surgery and the oral appliances that reposition the jaw or tongue. I found excellent results while using the Winx System. Traditional CPAP was really not well tolerated. I was considering Hypoglossal Nerve Surgery and came upon the Winx. Yes the upkeep is expensive, but the results surely out weighed the cost. It appears that the company has gone out of business. Does anyone have any current knowledge on Apnicure Company? The company has gone out of business. It seems like there were not enough patients with your experience. I used the Winx the device early on in 2013 when it was in trial It really worked well…but you had to keep the tubes clean. That was the biggest problem but I used the device until late 2016. It was excellent! Took my sleep apnea problem from 54 episodes an hour to 1-2. I have struggled since i could not find a new machine (mine died) and dont really want a CPAP. if I could find some inventory I would buy a bunch of units. The concept of sucking your tongue to the roof of your mouth was ingenious…and, it would train your tongue so if you used it 5 nights in a row, you wouldn’t have to for 2-3 nights. The suction I think also works to fight the gravitational pull that slowly closes your airways as you age. Someone needs to revive this technology!! !